Wool Pets, Making 20 Figures with Wool Roving and a Barbed Needle and Wool Toys and Friends: Step-by-Step Instructions for Needle-Felting Fun. 1. What does your workspace/ design space look like? My studio space is located at my house in a big, spacious room. I'm lucky to have my own space to work in, although my hubby works in an adjacent room. Most of the time this works out pretty well for us, since we kinda work together on Woolpets. I love looking out the window at the cedars and birds in the branches. Here's a photo of the other side of the studio, with me getting ready to shoot a series of steps for our Woolpets needle felting kits. 2. Do you save your mistakes/ or designs you don't love right away, or do you ditch them? Most of the time, I save them. I can always use pieces and parts of things to make other things. 3. What's on your "next to try" list? 5. Do you ever work with recycled materials? Not necessarily recycled materials, but mostly natural materials; wool, wood, etc. 6. What music do you listen to when designing? I like listening to audio books. I just finished listening to The Diary of Anne Frank. I also listen to independent radio programs like Democracy Now. 7. How long does a design take you to create? It's hard to say how long it takes from the time I get an idea until the time I've made a pattern for it, photographed the steps, put it into a format for printing, etc. The process can take at least a month! 8. How do you organize your supplies? I've got wool shoved in every nook, drawer, and cupboard in my studio. I try to keep the wool bagged up because I also have camera and computer equipment in the studio. Keeping things tidy is pretty important to me. 9. What books/magazines do you read? Last year, I started reading with kids at the local elementary school, and found that there are lots of great books written for children/young adults, some that I missed when I was growing up. So lately I've been on a kick reading Newbery Award winners such as Walk Two Moons by Sharon Creech. I also love the Diary of a Wimpy Kid series. Along the same lines, I enjoy Cricket magazine. I guess I'm still a kid at heart! 10. How would you describe your personal style? 11. How do you determine what a design is going to be made with? Everything is made with wool! 12. Do you have a collection of anything? I collect picture books, puppets, miniatures, and decorative papers to name a few things. All these serve as inspiration for my artwork. 13. How did your book come to be made? The folks at Creative Publishing international contacted me via email many years ago when I was really getting into needle felting. I was a little intimidated at first, but CPi made everything very easy and fun! Since my hubby is a photographer, he got to do the photos for the book which made it convenient for us. Writing the instructions is a tedious job, but I'm glad people who read the book can understand them! 14. And the all important question (from Ravelry): What is your favorite swear word? According to my mother, a few of the first words I said as a babe: "Damn it!" My live sheep 'Hazel' with her anthropomorphic counterpart. Thanks so much Laurie for this adorable look into your world! This adorable book shows how to make a wide variety of birds by needle felting—sculpting wool roving into a three-dimensional figure using a special barbed needle. Each project includes a fun photo of the project with step-by-step instructions that result in 20 types of feathered friends! Laurie Sharp is a full-time artist and has been needle felting for over 10 years. She raises her own sheep and shears and processes the wool for most of her projects. From her web site www.woolpets.com, she sells needle felting kits and finished pieces as a business that has become overwhelmingly successful. Her work has been shown in a number of galleries in the Pacific Northwest. She lives in Suquamish, WA with her husband and business partner, Kevin Sharp. Kevin is a professional photographer, and provides both beauty and how-to photography for Laurie’s books. I love the old-fashioned bird clip-on style Christmas ornaments, and I know just what I am going to start working on now. Yes I know it's July but I want to make a whole tree filled with these cuties! Check out this awesome tutorial on how to make needle-felted bird ornaments featured in the new book Felted Feathered Friends: Techniques and Projects for Needle-felted Birds. I love the idea of adding some metallic fibers to make these birds sparkle a bit. I did a little "Googling" and I found this site D. Blumchen and Company as a source for the clips. Click on these pages from Felted Feathered Friends: Techniques and Projects for Needle-felted Birds to enlarge and read the step-by-step tutorial on how to make a needle-felted bird Christmas clip-on style ornament. Is this not the cutest little Japanese needle felted doll ever? It is from Wool Toys and Friends. What makes it so darn cute is the coy sideways eyes combined with the pretty smile. Creating faces can be the most daunting aspect when creating a plushie of any kind. I recently did a bunch and I was really intimidated when it came to the faces. It is what truly gives the creation a personality. Click on the images to see how to needle felt this adorable Japanese face. 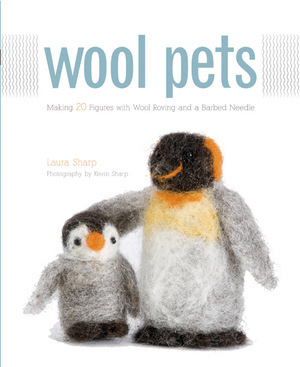 This volume teaches and illustrates fun, needle-felted projects to add to your collection of Wool Pets. The instructions include wet-felting and various embellishment techniques along with the needle felting and discusses the ways that folk art and nature inspire the projects. Heirloom hand-crafted wooden or cloth toys, birds and other animals have inspired and influenced the projects which have been translated into needle-felted art. Laurie Sharp is a full time artist and has been needle felting for over 7 years. She raises her own sheep and shears and processes the wool for most of her projects. She has been featured on HGTV's That's Clever. You can view her web site at www.woolpets.com. Her work has been shown in a number of galleries in the Pacific Northwest, where she lives with her husband and business partner, Kevin Sharp. Kevin is a professional photographer, and provides both the beauty and how-to photography for this book. His work can be viewed on www.sharpphotography.com. I had the pleasure of meeting Laurie Sharp, author of Wool Pets and the brand spankin' new Wool Toys and Friends: Step-by-Step Instructions for Needle-Felting Fun at Maker Faire. She was so nice and cute as her darling creatures that she creates. To celebrate the release of Wool Toys and Friends, I am giving you this full tutorial on how to needle felt the positively cutest hedgehog pin cushion. If you want to see tons more from the inside of this book, pop on over to Amazon by clicking here and you will see a whole bunch of the inside pages that include lots of the images of Laurie's creations that are included in the book. Click on these pages to enlarge and read how to needle felt a hedgehog pin cushion. Laurie Sharp is a full time artist and has been needle felting for over 7 years. She raises her own sheep and shears and processes the wool for most of her projects. She has been featured on HGTV's That's Clever. You can visit her web site at www.woolpets.com. Her work has been shown in a number of galleries in the Pacific Northwest, where she lives with her husband and business partner, Kevin Sharp. Kevin is a professional photographer, and provides both the beauty and how-to photography for this book. His work can be viewed at www.sharpphotography.com. There will be so much to see and do. 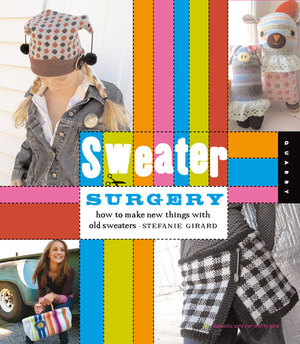 I will have my stash of recycled wool felted sweaters and Sizzix die cutter there for you to craft up a cute and colorful custom accessory. See all our YouTube videos! Click here to see all our Craftside how-to videos on YouTube!